Gun Control Legislation: House Passes Sweeping Bill The legislation mandates background checks be performed on all gun sales, including firearm purchases made privately. The Senate is unlikely to take it up. 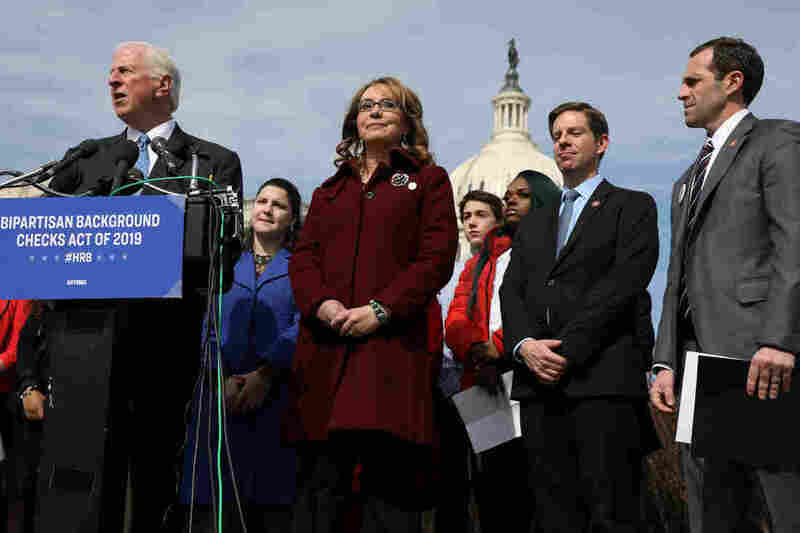 U.S. Rep. Mike Thompson (left), D-Calif., joined by shooting survivor and former Rep. Gabby Giffords of Arizona, holds a news conference about his proposed gun background check legislation, on Capitol Hill on Tuesday. A second bill, expected to be taken up Thursday, would extend the period federal authorities have to complete a background check before a gun sale can go through. Under current law, if a check isn't finalized in three business days, the transaction can automatically proceed. House Democrats hope the swift passage of the companion bills will put pressure on the Senate to act. The National Rifle Association opposes the legislation, and it faces major headwinds in the Republican-controlled Senate. In the unlikely event the Senate approves the measure, the White House has already signaled the President would veto the bill, should it reach his desk. As its name suggests, the first bill did garner modest GOP support, even attracting five Republican co-sponsors. Yet, in the end, only eight Republicans crossed party lines to support the bill. In a statement John Feinblatt, president of the anti-gun violence group Everytown for Gun Safety, praised lawmakers for "stepping up." "We applaud Speaker Pelosi and the bipartisan coalition of House members who supported this bill for stepping up and doing their part to close the giant — and deadly — loopholes in America's background checks law." Chris Cox, executive director of the National Rifle Association's Institute for Legislative Action, issued a statement, calling the background check bill "extreme," adding it will "make criminals out of law-abiding Americans." "Criminals, on the other hand, will continue to get their firearms the way they always have – through the black market, theft, and straw purchases. Forcing more government paperwork and additional fees on good people trying to exercise a constitutional right will do nothing to make Americans safer," Cox said. At a press conference ahead of its passage, the bill's sponsor, Rep. Mike Thompson, D-Calif., called it a "historic time," adding that expanded background checks would "help save lives." He also highlighted the difficulty of getting a gun control vote during the previous eight years, when the chamber was controlled by a Republican majority. "We were not able to get a single hearing or have a single vote in the House under the last majority. It's a new day," Thompson said. He was joined by former congresswoman turned gun control advocate Gabby Giffords who nearly died from injuries sustained when a gunman opened fire at a constituent meeting in Tucson, Ariz., in 2011. She said stopping gun violence takes "courage." "I've seen great courage when my life was on the line. Now is the time to come together, be responsible. Democrats, Republicans, everyone," Giffords said. Critics of the bill, including many Republicans, say the background check legislation would have done nothing to stop many of the recent mass shootings, including the one in Parkland, Fla., where 17 students and faculty were killed at a high school. They also argue that if passed into law, the bill would prevent law-abiding citizens from having access to firearms. One prominent opponent of the background bills is Rep. Steve Scalise, R-La., the House minority whip. He was severely injured during a shooting at a congressional baseball practice in Virginia in 2017. He appeared in a video tweeted out by the NRA on Wednesday ahead of the vote. "I'm proud to work with the NRA to oppose these gun control bills they are bringing to the Capitol – HR 8 and HR 1112," Scalise said referring to the official names of the Bipartisan Background Checks Act and the one that advocates say would close the "Charleston loophole." "Both of these bills will strongly infringe upon the rights of law-abiding citizens to buy and ultimately share their own guns," he said. HR 1112, sponsored by House Majority Whip James Clyburn, D-S.C., would give the FBI more time to complete a background check. Supporters say because of the flaws in the current system, a white supremacist in 2015 was able to buy a gun and kill nine churchgoers in Charleston, S.C., despite having a drug arrest that should have prevented him from getting the gun. Public opinion polls show a large majority of Americans support background checks for gun buyers. A Quinnipiac poll last month found 92 percent of respondents supported background checks for all buyers. The poll found strong support even when factoring in the political affiliation of poll respondents: 95 percent of Democrats, 94 percent of independents and 89 percent of Republicans were in favor of background checks.